I am a huge fan of butter. Well, I am a huge fan of cream and its products in general. It started with the discovery that I could make super thick and delicious whipped cream of my very own (perhaps more on that subject later). When I was little, I loved the kind I could spray out of a can and into big dollops. Now I learned that what I make myself is much more enjoyable in flavor, doesn’t go flat upon sitting, and doesn’t have any unnecessary additives, either – it’s just the cream, perhaps with a small amount of sugar or flavoring of my choice. I was raised on margarine, but upon going out and living on my own, I shifted away from this product, and now I can barely stand it in comparison to butter. Even so, I had always simply bought my butter from the store, or from the area’s Amish on occasion that I passed by. My cream purchases usually got turned into whipped cream or put into my baking. After I obtained a pint of grass-fed, organic cream from the Jersey cows at Evans Farmhouse Creamery, though, I decided I was going to do something different this time. I had enough whipped cream. 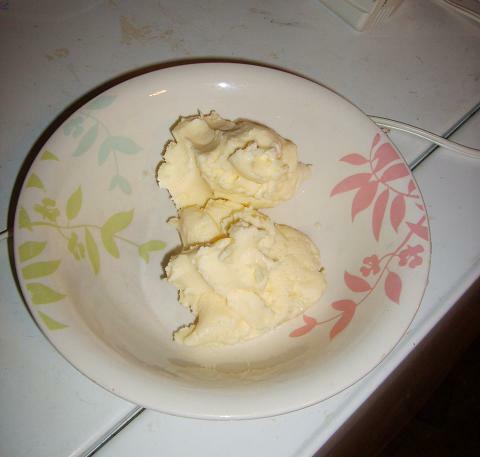 It was time to try making butter… and I succeeded. The result was glorious, with a creamier, stronger ‘butter flavor’ than I had ever had before. Wanting more, I picked up some quarts of a larger local brand and got busy. A lot of the time, making your own stuff at home saves you money. I am not going to even pretend it’s the case here, as it’s certainly not always cheaper to do it this way. Pre-made, store-bought butter is relatively inexpensive for what goes into it, especially for conventional brands (non-specialty/non-organic/etc.) or generics/store brands. If you buy specialty butter, though, or you have a source of cream that’s inexpensive or from your own animals, you may be able to break even or make it cost slightly less. You have to look at the other benefits too, though. You get very fresh butter that hasn’t picked up any off flavors or sat on a shelf for weeks. You get to learn a new skill. You choose whatever cream you want, and you can add whatever flavors, herbs, or spices you like, in whatever quantity you like – or add none at all. You control the process. Best of all, it’s really easy. It just takes a bit of time. You start with about a pint of heavy cream. If you have a bigger container of it, just pour out roughly a pint. It doesn’t have to be exact. I only do this much at a time because it puffs itself up and flings itself around a lot, and more than this amount is hard to contain! Plus, a pint will give you just slightly shy of 8oz. of butter when you’re done, assuming yours is anything like mine. You can whip this cream using something as complex as a stand mixer, or you can do something as simple as constantly shaking a container with a tight lid. The process is essentially the same. For the sake of simplicity, I am going to describe how I did it, using a small electric hand mixer. … but you keep going after… and going, and going… until it starts to clump up and stop looking so pretty and white. It begins to take on a yellowish tinge at this time. This is an indicator that you’re getting close! Keep going! After a few more moments, the yellow really starts to stand out. 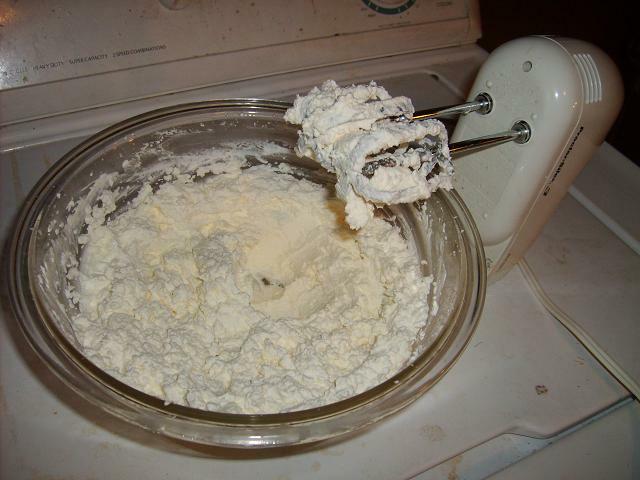 The cream separates fully, and little particles of butter start flinging themselves around the bowl as they’re tossed by the mixer. If you stop to check it, you’ll see a pool of buttermilk rapidly flow out and puddle underneath. The butter has appeared! This is where you can stop (although if you’re unsure if it’s done, you can keep mixing for a bit longer – you won’t hurt it now). 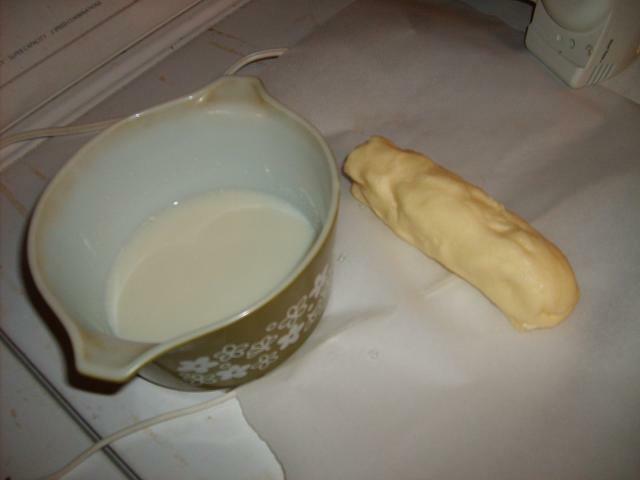 Take a strainer, cloth, or anything else suitable and spoon the butter mixture into it. The buttermilk will start to drain out. 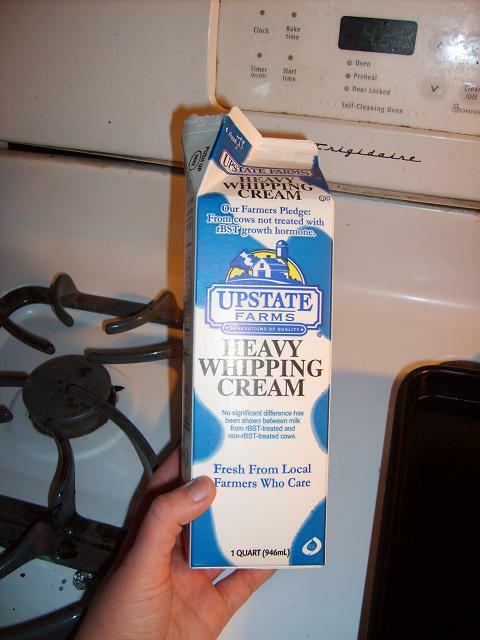 You can get rid of it if you really want to, but it’s good to drink, or you can use it for baking (although it is not the same as the cultured buttermilk you buy in stores). 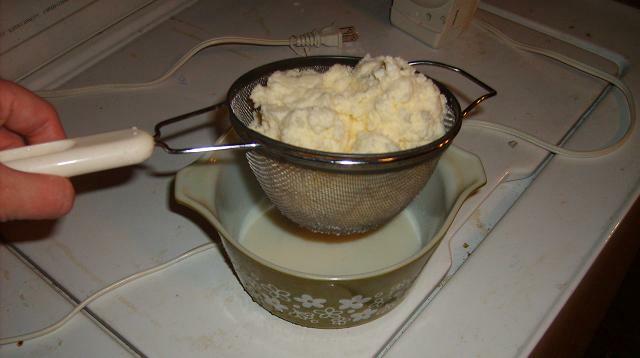 After it drips for a bit, take the butter in the strainer and dump it into a different bowl. 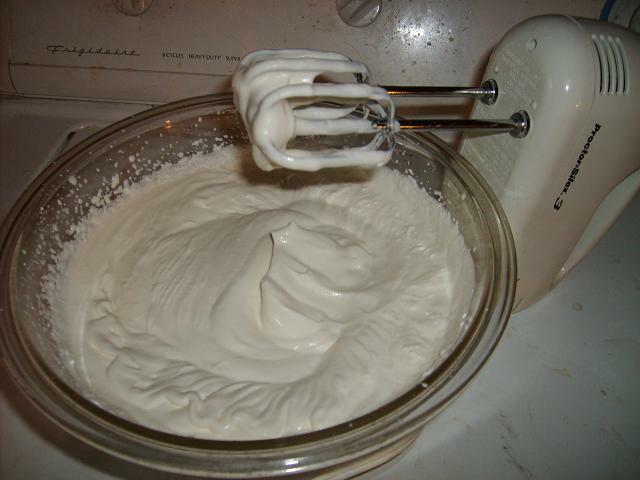 You can use the bowl you originally mixed the cream in – just rinse it lightly first. Run cold water over the butter in the bowl. You’ll see this water turn cloudy as buttermilk comes out. Knead the butter with your hands, folding it over on itself and pressing more buttermilk out, gathering the little bits of butter together. Dump the water out, and put new cold water on, repeating the kneading until the water is relatively clear. It’s important to get the buttermilk out (or most of it anyway), because it goes rancid rather quickly and greatly reduces your butter’s storage length. You can also rinse the butter under cold running water to help in this. 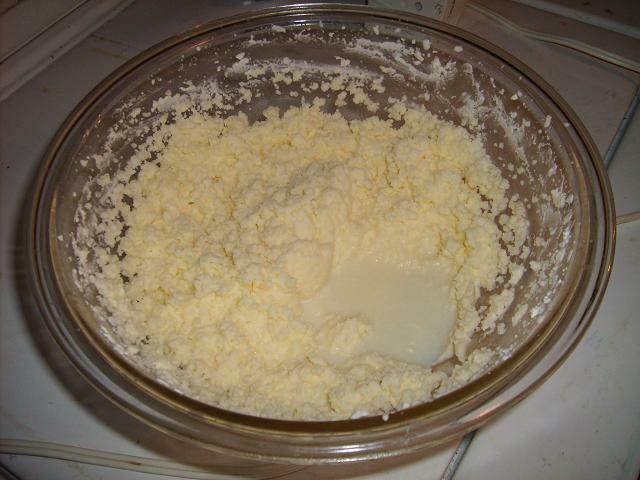 After you get the buttermilk out, you’re left with some handfuls of pure sweet cream butter like in the picture above. You can use it just like this, or you can add salt, herbs, or spices. I like to add just a small amount of salt, or mix in a spoonful of honey and some cinnamon for a great cinnamon-honey butter. Don’t worry about adding too little. You can sample it as you go, and you can always add more, so it’s far more important not to add too much from the start! Knead the ingredients in, in the same way you got the buttermilk out. If the butter gets too soft in your hands, cool it and your hands with cold water and continue. When everything seems well-incorporated, you can stop. So, from a pint of cream, you get a few ounces of buttermilk and a nice log of butter. You also get to say that you made butter, and you can do it any time you get the urge! The buttermilk should be refrigerated if not immediately consumed. You can press the butter into a mold, cup, or anything else of your choice, but I just lay mine out on wax paper and wrap it well. I then refrigerate it until it’s used up, or for longer storage, I place the wrapped butter chunk inside a freezer bag and freeze. It keeps well for a couple of weeks in the fridge, or for months in the freezer… if you let it last that long! I am totally doing this. Thank you! sure! you’ll have to let us know how it goes if you try it. :] it’s so easy and tasty, i highly encourage everyone to make butter at least once. Makes me want to get a Kitchenaid stand mixer even more.